We also had a lot of smiles in the comments this week,more than usual. They include smiles by Ritu, Chelsea Owens, A Soldier’s Walk, Robbie (Roberta) and Marilyn Armstrong (Go to the original post and scroll through the comments to see). Thanks all for the wonderful smiles. This week’s post will be up in about an hour. This entry was posted in Smile and tagged #weeklysmile, smile, smile recap, smile roundup, weekly smile on April 15, 2019 by trentpmcd. See, aren’t they all great? :) If I missed yours, please let me know and I’ll add it. I will post this week’s smile in about an hour. This entry was posted in Smile and tagged #weeklysmile, smile, smile recap, smile roundup, weekly smile on April 8, 2019 by trentpmcd. Some good smiles :) Let me know if I missed any and I will add them. This entry was posted in Smile and tagged #weeklysmile, smile, smile recap, smile roundup, weekly smile on April 1, 2019 by trentpmcd. As always there was a smile or two in the comments of the original post as well. 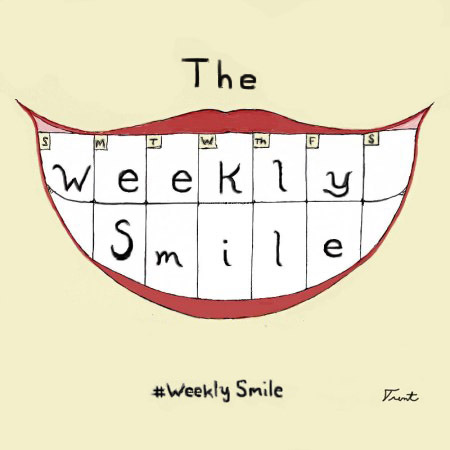 And a reminder, there is no limit on the number of smiles per week, though the reason for the double this week is that someone linked to last week’s smile as I was posting the recap – bad timing. This entry was posted in Smile and tagged #weeklysmile, smile, smile recap, smile roundup, weekly smile on March 25, 2019 by trentpmcd. Besides these links, There were a couple smiles left in the comments (as always) of the original post (See ‘Trent’s World’) in the list above. J. S. Pailly had a very productive week, which is always a huge smile (sometimes in hindsight ;) ). D. Wallace peach smiled because she got her taxes done early. This week’s Weekly Smile post will be up in about an hour. This entry was posted in Smile and tagged #weeklysmile, smile, smile recap, smile roundup, weekly smile on March 18, 2019 by trentpmcd. Another good week of smiles :) Check out the smiles below! Tess Can Do It! Positivity is Catching! On the original Post (top one in the list), there were a few smiles in the comment section, like Joseph’s dogs and Marilyn unplugging from cable. If I missed your smile, let me know and I’ll put the link in. This entry was posted in Smile and tagged #weeklysmile, smile, smile recap, smile roundup, weekly smile on March 11, 2019 by trentpmcd. As I said, some great smiles :) If I missed yours, please let me know and I’ll will put it up. This entry was posted in Smile and tagged #weeklysmile, smile, smile recap, smile roundup, weekly smile on February 25, 2019 by trentpmcd. The smiles are returning :) We are pretty much back to normal with the number of smiles :) Previous weeks must have just been a bit of deep-winter blues. Spring seems farther away than ever here in New Hampshire, but hopefully with more daylight people will be smiling more (I know, you on the other side of the world are getting less daylight, but it is cooling down (I hope)). Some great smiles this week! There were a few smiles in the comments and one (from Delphi510 at My Window) in the comments of last week’s recap post. This entry was posted in Smile and tagged #weeklysmile, smile, smile recap, smile roundup, weekly smile on February 18, 2019 by trentpmcd. Besides the posts, occasionally people leave “smiles” in the comments. Last week Charlotte Hoather had a great smile about the kindness of her singing instructor. I will be posting this week’s weekly smile in a little over an hour. I’m sure you all had something to smile about this week, from huge, like new houses or traveling half way around the world, or small, like a night out or a walk with the dog on a beautiful (if cold) day or even a timely pair of socks. This entry was posted in Smile and tagged #weeklysmile, smile, smile recap, smile roundup, weekly smile on February 11, 2019 by trentpmcd. Hi! Some great smiles as usualthis week. There were a few less, but people must be busy. I got a smile out of all of these and I hope you do as well!. Enjoy! What made you smile this week? This week’s Weekly Smile will be posted in a little over an hour and you can share it! This entry was posted in Smile and tagged #weeklysmile, smile, smile recap, smile roundup, weekly smile on February 4, 2019 by trentpmcd.